German botanist and zoologist; born in Breslau Jan. 24, 1828; died there June 25, 1898; eldest son of Isaac Cohn, an oil manufacturer, who for some time held the post of Austro-Hungarian consul, and brother of Oscar Cohn, a popular humorist and playwright whose pen-name was "Oscar Justinus," and of Max Conrad Cohn, a distinguished jurist. Cohn studied at the gymnasium and University of Breslau, and obtained his Ph.D. degree in 1847 at Berlin. His dissertation was a study of the physiology of seeds. In it he advocated the establishment of botanical gardens for the study of the physiology of plants—a wish that he was destined to see realized largely through his own efforts. He returned to Breslau in 1848, and remained there till his death. On a dissertation, "De Cuticula," he was admitted as privat-docent in Oct., 1850; but, being a Jew, a year elapsed before he was allowed to take the oath and to teach. He received the title of professor in 1857, and two years later (1859) wasappointed assistant professor. In 1872 he became professor, and was called to fill the chair vacant through the death of his old teacher, friend, and collaborator, Goeppert. In 1888, upon the opening of the Botanical Institute, which was built mainly through his untiring endeavors, he received the title of "Geheimer Regierungsrath." On the occasion of his seventieth birthday he was presented with the honorary freedom of the city of Breslau. Cohn's work gained universal appreciation during his lifetime. He was elected a member of the following institutions and societies: Leopold Carolinische Akademie, Royal Academy of Sciences of Berlin, Société de Biologie de France, the Royal Microscopic Society of Great Britain, the Natural History Society of Boston, U. S. A., etc. Cohn was buried in the row of honor in the Jewish cemetery of Breslau. Though not an observing Jew, he and his wife belonged to several Jewish societies. 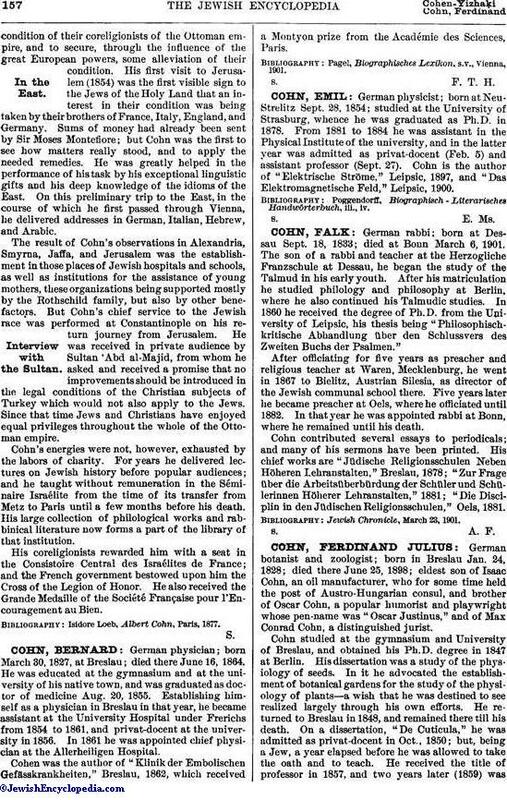 Cohn was a prolific writer; leaving behind him over 150 papers, essays, and books, of which the following may be mentioned: "Zur Naturgeschichte des Protococcus Pluvialis," Bonn, 1851; "Die Menschheit und die Pflanzenwelt," Breslau, 1851; "Der Haushalt der Pflanzen," Leipsic, 1854; "Untersuchungen über die Entwicklungsgeschichte der Mikroskopischen Algen und Pilze," Bonn, 1854; "Neue Untersuchungen über Bakterien," ib. 1872-75; "Die Pflanze," Leipsic, 1882. 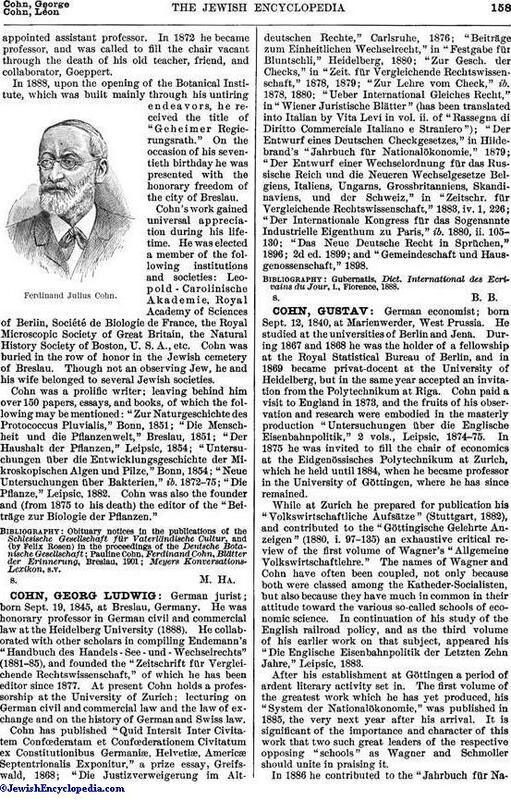 Cohn was also the founder and (from 1875 to his death) the editor of the "Beiträge zur Biologie der Pflanzen."